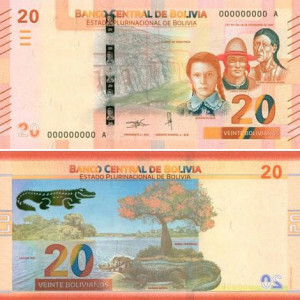 The Central Bank of Bolivia has issued and circulated the new 20- boliviano banknote, the second in the latest First Family of Tickets (PFB) of the Plurinational State [translated] following the issuance of the 10-boliviano banknote in April 2018. The design of the paper banknote includes illustrations of three historical figures, namely Genoveva Ríos, celebrated for rescuing the Bolivian flag during an invasion by Chile in 1879; Tomás Katari, who led one of the first indigenous rebellions in Bolivia around 1780; and Pedro Ignacio Muiba, who led another rebellion insurrection against his oppressors around 1810. Other illustrations include Laguna Bay, the Toborochi tree and the Black Caiman, covering landscapes, flora and fauna. Key security features include a 4mm wide windowed colour changing security thread, reportedly Picture Thread™, shown on the front of the banknote, and an image of the Black Caiman crocodile is displayed using optically variable ink, reportedly SPARK® Live Rolling Bar, shown on the reverse. Other features include watermarks, see through register mark and UV features including UV security fibres. The design also includes two blocks of six short tactile lines aimed at enabling the visually impaired to identify the banknote’s denomination. This is particularly important as the size of the 20-boliviano banknote is the same as the other denominations of the First Family of Tickets series. Read the Central Bank of Bolivia press release.